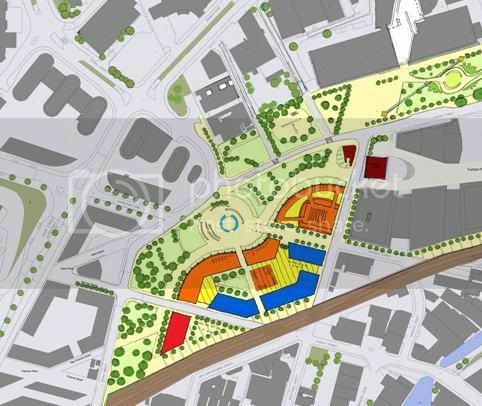 Here’s the “outline design” for the new BIAD campus in Eastside, as revealed on Simon Howes’ Eastside blog. Millennium Point is in the foreground and the red blob is Curzon St Station. Simon also has a top down map which pleasingly shows how much open space they’re planning to leave, which is nice as I like the amount of green currently there. It’s ironic that there is a ‘top down’ version…lost on most I imagine. I always love the way architects models have 100 year old established oak trees everywhere overnight. Is that the colour scheme they are going to use? Anyone who has a knowledge of colour theory in it’s psychological effect on environmental planning for work spaces will no doubt be planning for a 99% absenteeism as BCU staff take extended sick leave with depression. It looks a little like a funky multi-story car park from the model. Still at least we now know that BIAD will be the ‘new faculty’. Why? BIAD is art and what have they ever done? Look at the history of Birmingham its all industrial. Manufacturing of cars, bikes, trains, rail, roads, cannals, bridges, steam engines, Spitfires. The artists were let loose once – in the 60’s and now we are demolishing their rubbish. Yes great engineering has a bit of artistry about it, but lets look at Millenium Point _ Expensive stone floors, leaky roofs, one up escvalator, Stairs that can only be used in an emergency, doors that are never going to work, useless new fandangled heating system and the GREY colour?- Art all rubbish and what next RED, Green, Blue boxes full of more arty darlings!!!! Ah the angry mob is at the steps of the Art Gallery baying for some sanguin! Free thinking weirdo’s! Beardy Hog Bristle Painting extroverts! …still the assessment of the Millennium point was quite accurate. Is it me, or did Janice forget to take her medication this morning? very nice, its good to introduce a nice green space in front. spacilally in birmingham.